A coal-fired power station has been shut down after a fire broke out in one of its pump rooms. 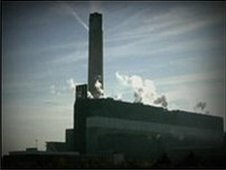 Fifteen fire engines and five specialist units were called to Kingsnorth power station in Kent at about 1925 GMT on Saturday. A spokesman for energy firm E.On said the oil fire had been contained to one of the pump houses. The building was badly damaged by the fire, which has since been put out, but no casualties were reported. A Kent Fire and Rescue Service spokeswoman confirmed firefighters had put out the blaze and were no longer at the scene. A skeleton E.On staff of around 20 had been on site at the time of the incident. The E.On spokesman added: "We will have a better idea of how much damage has been caused in the morning. "The power station was shut down as a precautionary measure. It will remain shut down until it is safe. The National Grid has catered for the loss of capacity, so this won't cause any power cuts." Kingsnorth is a 1,974 megawatt capacity power station, providing power to 1.5 million homes per year. Last year, hundreds of environmental campaigners camped in its shadows as part of a Camp for Climate Action protest against plans to build a new coal-fired power station at the site. However, the plans have now been put on hold for up to three years after E.On said electricity demand had fallen during the global recession.